I never saw The Nightmare Before Christmas, a 1993 film. But that’s fine, because I am already dealing with my own nightmare with the holiday just around the corner. What’s haunting me in the specter of a value-added tax, which some reporters now think is a clear and present danger (my concern, not theirs). We’ll start with this disconcerting report a couple of days ago from Politico. By the way, there’s a huge mistake in the above excerpt. 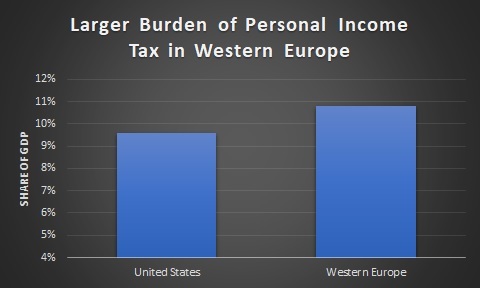 I don’t know if it’s because of dishonesty of incompetence, but the reporter is wrong to claim that other nations “lighten the load of their income tax.” Here’s a chart, based on OECD data, comparing the burden of personal income tax for the U.S. and Western Europe. In other words, governments adopt VATs because politicians want to spend more. And what sort of spending will we get? Our statist friends are salivating at the thought of financing a bigger welfare state. And here are some excerpts from a Yahoo column from earlier this month. We’re being warned that politicians will use the next fiscal crisis to impose a VAT. Gee, isn’t that wonderful. The politicians will spend us into a fiscal cul-de-sac, and then use that spending crisis as an excuse to seize more of our money. And I can’t resist sharing this passage to remind folks that those of us who opposed the “border-adjustment tax” were on the side of the angels. The BAT was basically a pre-VAT. Yes, it is certainly the case that bad ideas never go away in Washington. Let’s close with an amusing poem from Reddit‘s libertarian page. P.S. If minimalist poetry isn’t your cup of tea, you can enjoy some cartoons about the VAT by clicking here, here, and here. P.P.S. The clinching argument is that Reagan opposed a VAT and Nixon supported a VAT. That tells you everything you need to know. Income taxes, both corporate and individual, are consumption taxes in that the consumer actually is the one paying the tax. Domestic products are fully taxed. Imported products (and components) are taxed only based on the corporate profit on sales price minus cost. The right approach to taxing imports is not to apply a BAT on entry and to eliminate all tariffs. However, the deduction for the import cost should be disallowed, in effect taxing the imports at the corporate rate. This means that all products purchased in territorial US would be fully taxed. Since the US imports more than it exports, this would add to the taxable base and should lower the corporate rate.